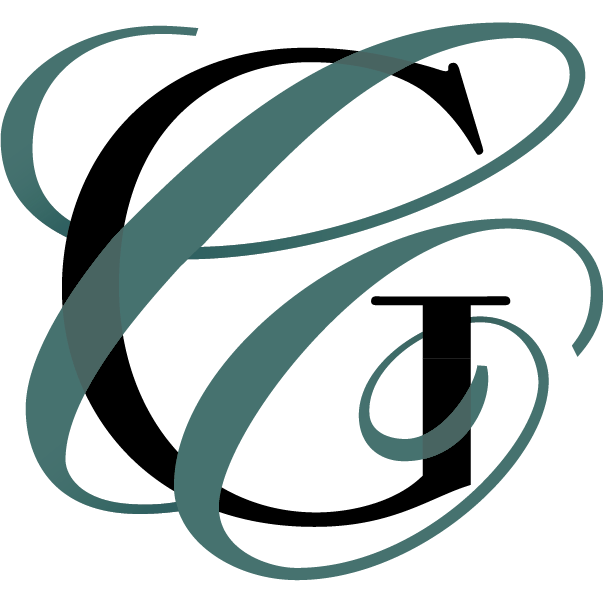 Quaint Cambria: Central Coast Gem! The quaint little town of Cambria on California’s Central Coast is the essence of time gone by. Things move at a slower pace. People are friendly and warm. They look you in the eye and want to know how you’re day is going. 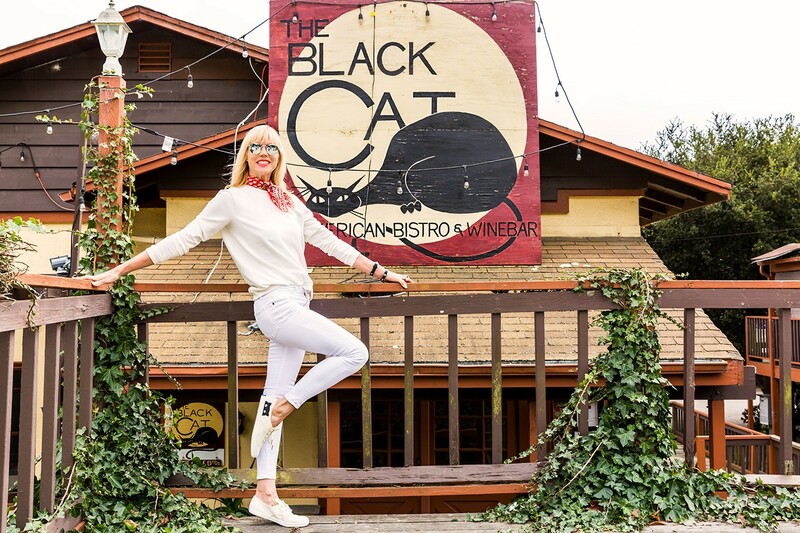 It’s a bit old fashioned and that’s just fine by me, and the many locals and travelers drawn to this mecca of rejuvenation on the California Central Coast. Pulling into the El Colibri Hotel was the start of a marvelous stay and adventure in this beautiful part of the state. It’s charming exterior is sweetly tucked into the most breathtaking vistas of Mother Nature. Warmly greeted by the friendliest staff, El Colibri evokes a feeling of coming home. I was in need of some rest and rejuvenation and I couldn’t have discovered a more inviting locale. 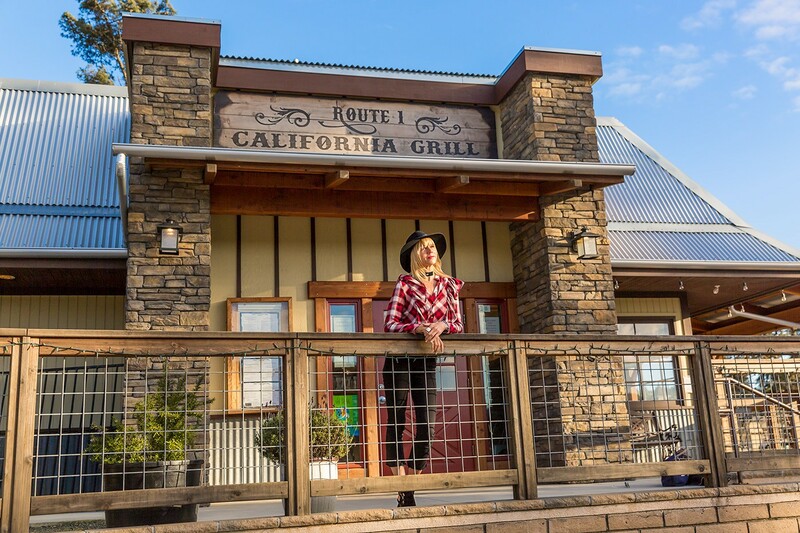 Nature plays an important role in setting the vibe of both the hotel and the town of Cambria. Known for it’s charm, Cambria is reminiscent of my days growing up with the Andy Griffith show in my living room. It’s about as homespun as they come with Cambria Coffee drawing the morning crowd. My usual routine is to wake up and have some form of body movement. Yoga on Moonstone Beach was the perfect way to begin the day. Cambria Coffee is usually filled with regulars. They whipped up a frothy, delicious decaf latte and I joined in with the locals. Meeting a lovely jewelry designer, I pulled up a seat and shared some lively conversation over a savory quiche. Growing up in the Midwest, I felt right at home as I love nothing more than to hear people’s stories. Back to the hotel to pick up a book and put my feet up as that’s what getaway weekends are all about. There’s nothing like diving into a great book to lose yourself in the story. Later that evening, I ventured into town to head to Madeline’s Restaurant. With some time to spare, I walked through the rustic downtown and discovered some fabulous treasures. 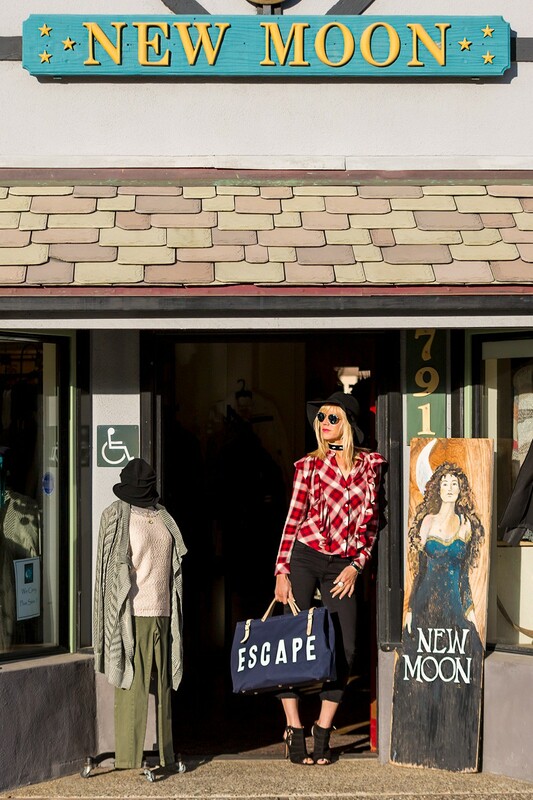 Wearing a plaid top from Zara (I’ve linked similar styles as this is no longer available) and cropped skinnies from AG Jeans found at Cami Boutique in Manhattan Beach, I had a blast wandering through the charming boutiques. 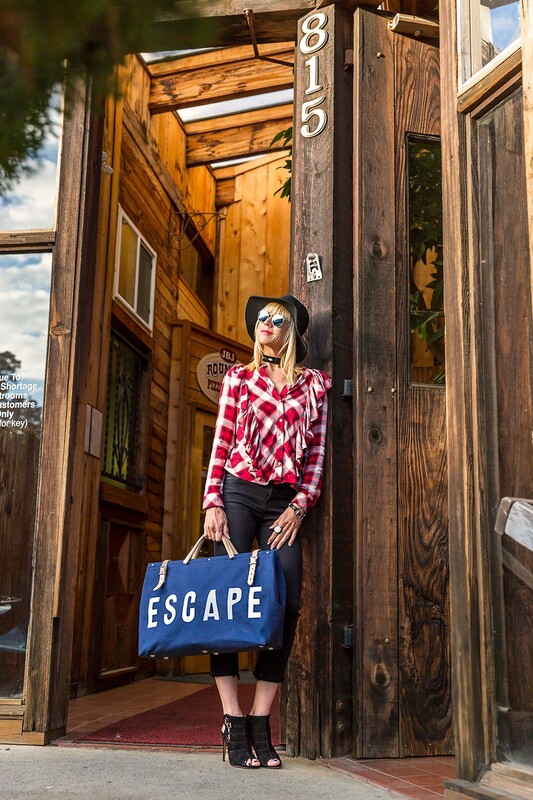 I brought along my favorite sandals from Aquazurra (I’ve linked similar styles), a floppy hat from Whole Foods and an all too apropos “Escape Bag” from Forestbound. New Moon Boutique is a lively and eclectic shop in the heart of downtown. Overflowing with distinctive designs, it was a fun shopping distraction. This area of town is one darling shop after another. You could spend an entire day investigating the town with it’s colorful shops and venues. One of the sweetest stops is the Old School House. Reminiscent of much earlier times, it’s a bit of a time warp and I couldn’t resist the capture along with a red apple! Most are too young to recall the days when we brought an apple to our teacher! But those memories are alive in well in me. As a Fashion Blogger, changing clothes is part of the lifestyle and I quickly tossed on my favorite skinny white jeans by Frame Denim. How could I resist this sassy “I Would Rather Be A Rebel” sweatshirt from Boohoo? The Taylor Swift Keds were a fun find on Amazon and the bandana from Madewell finished off the look. The sunnies are classic Rayban and rarely leave my side. 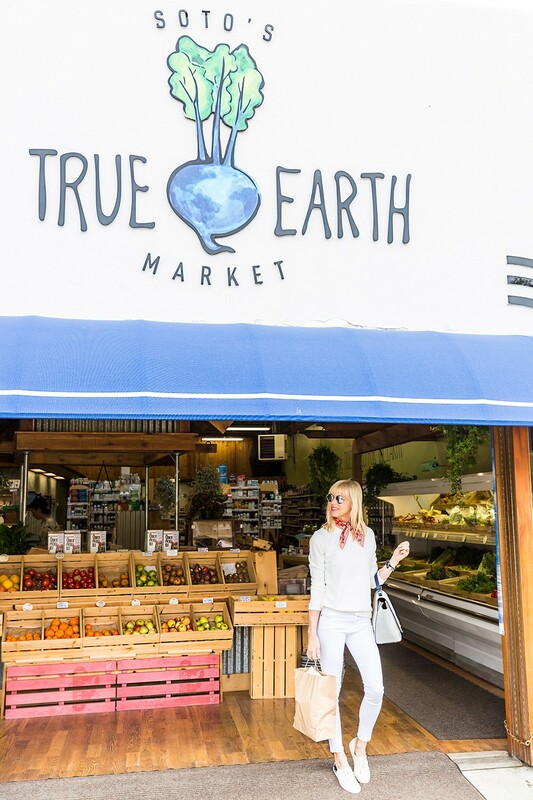 Healthy fare has been a staple in my life and I’m always on the lookout for health food stores. Don’t you have a hard time finding healthy fare when you travel? 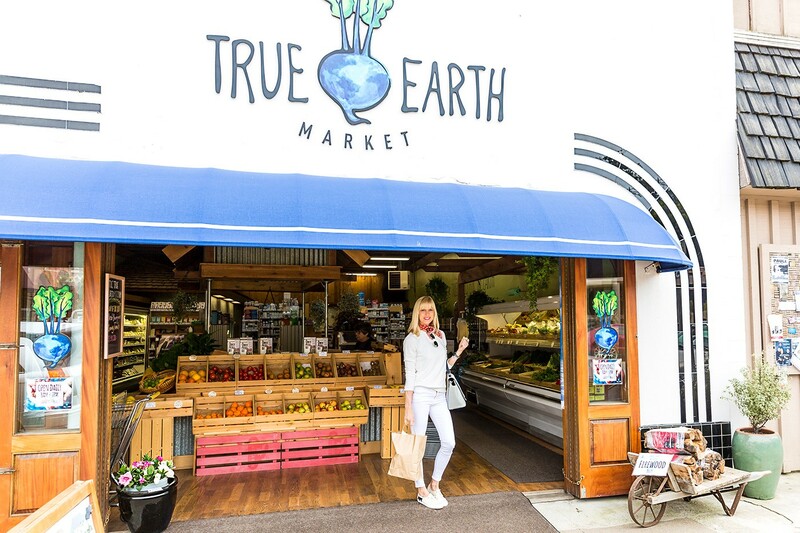 I know I do and I was delighted to discover True Earth Market, a shop overflowing with the healthiest organic food around. I was like a kid in a candy store! With the most delicious fare, there’s a delightful spot in the back of the store with healthy soups, fresh quinoa salads teeming with roasted vegetables and vibrant salads. Feeling happily satiated, I resumed my stroll around town. Seeing The Love Story Project out of the corner of my eye, I high tailed it over. Curious as to what it was about, I learned the story behind the vision. With a desire to share powerful love stories of couples that have lasted the test of time, the Project was started to capture and share these stories. With a darling gift shop loaded with colorful art and custom screen printed tees, it’s a fabulous diversion that will leave your heart feeling warm. Cambria is a town that feels like it’s preserved in time. A skip away from the vineyards of Paso Robles, there’s much to see and enjoy. Their wine is well known around the world and it captures the essence of this charming town. 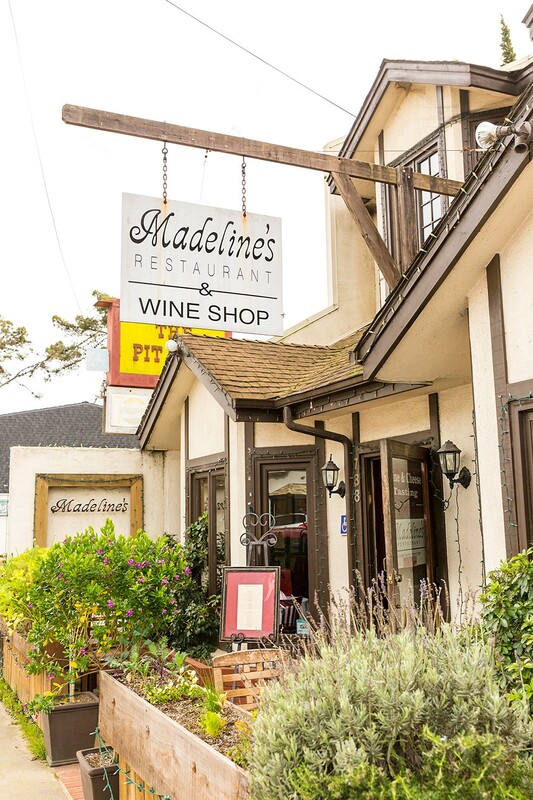 It was time to end the night at Madeline’s Restaurant, a cozy locale with a distinctive casual vibe. Friendly and warm, the menu is a combination of American and French with an emphasis on seasonal, organic fare. They offer wine tastings from the local vineyards and it’s a winning combination that keeps the establishment filled with satisfied customers. Their spring salad was so fresh with delicious baby artichokes, pistachios and goat cheese. I couldn’t resist giving the savory crab cakes a whirl and they didn’t disappoint. I was on a weekend getaway and decided to treat myself to a sweet treat. The key lime pie with fresh whipped cream had my name on it and I was so glad that it did! Madeline’s is a top choice of the locals and I can definitely see why. Cambria, you won my heart and I cannot wait to return. If you’re looking to slow down and in need of rest and rejuvenation, I highly encourage a visit to this charming enclave. Don’t we all need time to slow down? I know I do. See y’all in Cambria as we turn back the clock and return to a place of ease and grace. Cheers beauties!